Ultra Low Pressure Transducer, ±1 "WC, 0-1 "WC, ±0.5 "WC, 0-0.5 "WC, ±250 Pa, 0-250 Pa, ±125 Pa, 0-125 Pa. It is ideal for monitoring pressure for air or other clean inert gas. 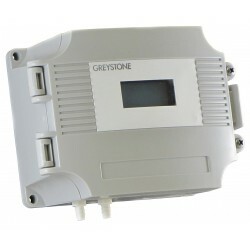 Options include an LCD to display the pressure value and an alarm relay with a variable trip point. The LCD and alarm relay are standard on the BACnet model.